"He let me ride in his cabin, and as I watched the red earth pass beneath us, and the dense forest up ahead, and the green hills to my right where monkeys frolicked in the tree branches, and the odd gang of half-dressed children who had stopped on the paths to watch us, as the driver hummed "onward Christian Soldiers" while adjusting his controls, and the engine went clackety-clack on the rails, I told myself how desperately I loved this country that somehow could not quiet accept me. Was there really something prohibitively negative in me, and in those like me, with our alien forbidding skins off which the soul of Africa simply slipped away?" The book is well structured with three longer sections and then a short section at the end. The first section deals with Vikram growing up in a smaller town as the Mau Mau uprising stirs around them. 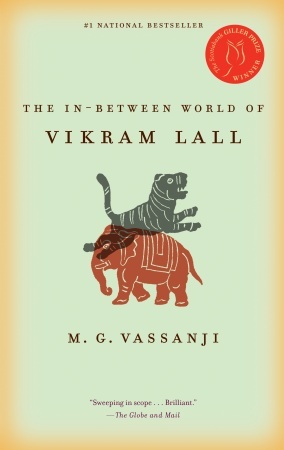 Vikram and his sister Deepa are friends with two British children, Bill and Annie, and an African boy, Njoroge, the grandson of a servant of the Lalls. This section does not end well, as the Mau Mau rebels murder Bill, Annie, and their parents. The second section takes place 10+ years later in Nairobi where the Lalls moved shortly after the first section ends. Njoroge is re-united with his Indian "family" and he and Deepa fall in love. This section also does not end well, as the prejudice towards inter-racial marriage drives them apart, and they both marry other people. The third section takes place in the decades following, as Vikram is gradually drawn into the powerful circles as government, slowly realizing that he is there as an Indian scapegoat on which to place the blame for all of the corruption taking place around him. This section (surprise, surprise) does not end well, as Njoroge is assassinated, Deepa's husband dies, Vikram and his wife separate, and Vikram is forced out of his country to Canada with his name at the top of his country's List of Shame. The fourth and final section takes place with Vikram returns to Kenya in an attempt to clear his name and regain the ability to visit his home country. This section ends ambiguously, and I'm not going to reveal any more! It sounds like a depressing book, but really it isn't. There are definitely some heavier issues brought up - corruption, race relations, post-colonial history in Africa - but what really shone through for me were the characters and the love that they have for one another. The different sections of the book are drawn together as Vikram tells his life story to a friend in Canada, with some input from Deepa and Njoroge's son Joseph. The narrative ends somewhere in the mid- to late-90s, however many issues are still relevant today. There is still corruption in Kenya and much of Africa. There is still inter-tribal conflict in Kenyan politics that flares up every couple of years (most recently following the general elections on Dec. 26, 2007). Inter-racial marriage in Africa is still very uncommon. I think that I liked this book at least as much as The Book of Secrets, and definitely more than The Gunny Sack. I suspect that this story will stay with me longer than either of the other two.